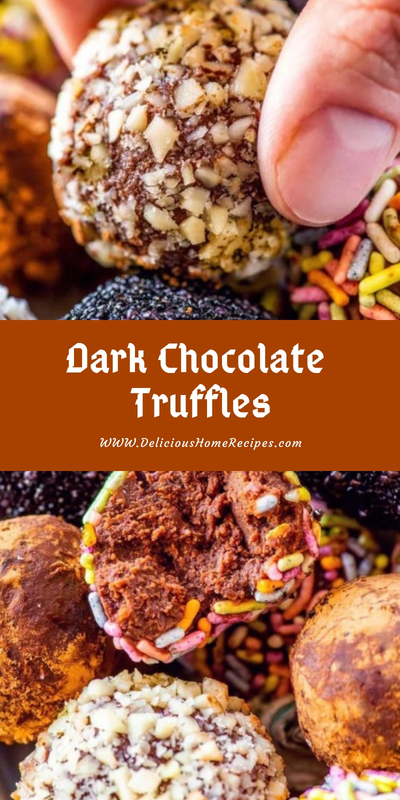 These rich dark chocolate truffles come together with just 3 core ingredients and make for an easy delicious dessert or a fun gift for a chocolate lover. Between the rich chocolate center and all the fun coatings you can use, these little confections end up being the perfect fit for snacking, gifting, or parties. They’re perfect all year long, but I usually make them during the holidays, coated with chopped up candy or festive sprinkles. And on a rainy day, I may make a batch (or two) just for myself. You know, just so there’s something to snack on while I’m binge-watching the latest release on Netflix. Chocolate truffles as we know them (round chocolate candy with some sort of coating) originated in France in 1985. And at the time, they seemed to feel that this new confection resembled a truffle, which is a type of mushroom. Truffles are dark brown, round, and have a textured surface, which does, in fact, look a lot like a candy truffle coated in sprinkles. In a medium bowl, add chocolate chips and butter. Set bowl aside. In a small saucepan, bring heavy whipping cream to a boil over medium heat. Once boiling, immediately remove from heat and move on to the next step. Pour cream into the bowl with chocolate and butter. Let stand for 2 minutes (do not stir yet). 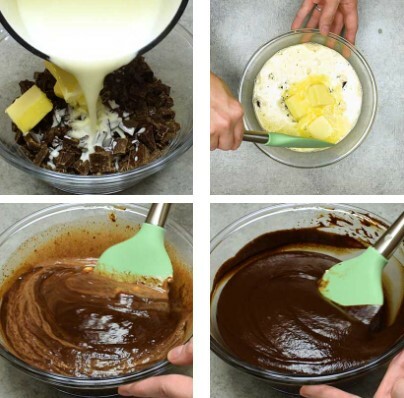 Whisk or stir chocolate and butter together until melted and smooth. If butter is not melted, heat in the microwave for 20 seconds at a time, mixing thoroughly between each time. Transfer bowl with the chocolate to the freezer for 1-2 hours or until chocolate is firm enough to handle and work with. When ready to work, prepare your work area by having a tray or plate nearby for the rolled truffles. Also have plenty of wet cloths or paper towels handy. Bring chocolate truffle mixture out from the freezer, then use a spoon (or cookie scoop or ice cream scoop) to scrape out about 1 tablespoon of chocolate. Roll the chocolate between your hands to form a ball, then place the finished ball on the nearby tray. Repeat this step until all the chocolate has been used. Transfer rolled chocolate to the freezer and allow to chill for 30 minutes. Place your chosen toppings (sprinkles, chopped nuts, cocoa powder, etc) into small bowls. 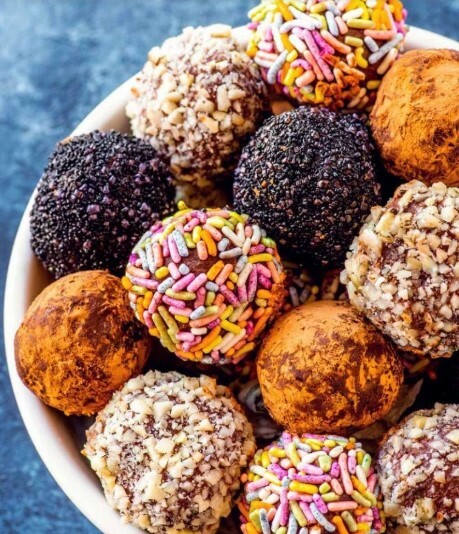 Remove the chocolate from the freezer and roll each truffle in toppings as desired. Once coated, freeze the truffles a third (and final) time for about 30 minutes to set the toppings. Serve truffles immediately. For best results, store chocolate truffles in a sealed container in the refrigerator for freezer until ready to eat.